Kelly Bennett loves fish. "Fish are fun and funny," she says. "Just watching them makes me laugh." When she's not writing, Kelly creates tile mosaics and digs in her garden. She has two grown children, Max and Lexi, and lives in Texas with her husband, Curtis, and their goldfish—whom she would never trade. Noah Z. Jones loves drawing fish of all shapes and sizes, but especially smallish orange ones named Norman. This is his first children's book. He lives in coastal Maine with his wife, Diane, and their tuna-lovin' cat, Mabel. This eye-catching book makes a satisfying read-aloud choice for pet day or any day. This emotional turnaround never feels forced or pat, thanks to a strong partnership between Bennett's text and newcomer Jones's artwork. The off-the-cuff yet kidlike prose ideally suits the bright, crisp, digital drawings. 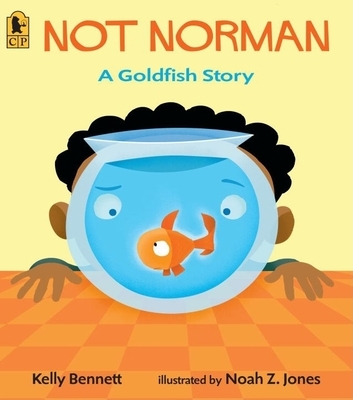 An inventive interpretation of the old adage 'Don't judge a book by its cover,' NOT NORMAN is the perfect book for dog-resistant parents to read to their puppy-worshipping kids-as long as they're willing to take on a new goldfish or two.